Welcome to the largest club on the planet for Honda Valkyrie Motorcycle enthusiasts! Check out the new 1800 Valkyrie message board! InZane XIX Registration is OPEN!! Click here! Add my Event to the list! What is Valhalla Voyage? It was a Valkyrie relay across North America! VRCC member Dag Verpeide of Norway provided us with a pair of Viking Tankards. They quite appropriately have dragons as their handles. We planned a relay to carry those Tankards around North America starting with the VRCC head office in San Dimas, California and ending at Inzane VIII in Johnson City, Tennessee. 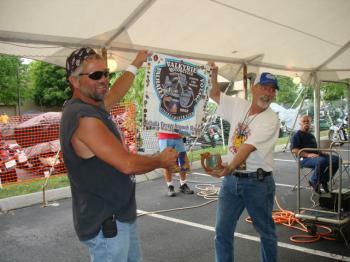 The relay also carried a VRCC banner and a log book of sorts that participants signed and logged their travels. There was a fabric bag to transport the banner to which each states delegation did, if they desired, attach a state pin. The North American Valhalla Voyage ended in Johnson City, Tn with Smokin' Joe handing the Tankards back to the VRCC President, oZ at the Inzane opening cermonies! 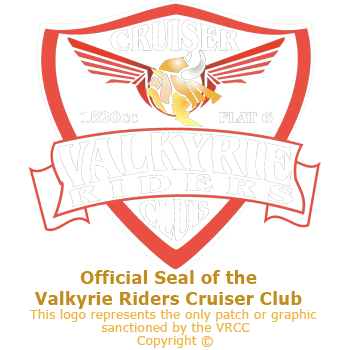 © Valkyrie Riders Cruiser Club. All rights reserved.